J. Pierpont Morgan [1837-1913], New York. (Duveen Brothers, New York); sold 1915 to Peter A. B. Widener, Elkins Park, Pennsylvania; inheritance from the Estate of Peter A. B. Widener by gift through power of appointment of Joseph E. Widener, Elkins Park. The Metropolitan Museum of Art, New York, c. 1910-1911. Residue of vermilion seal paste adheres to the biscuit of the contacting surfaces of top and bottom. 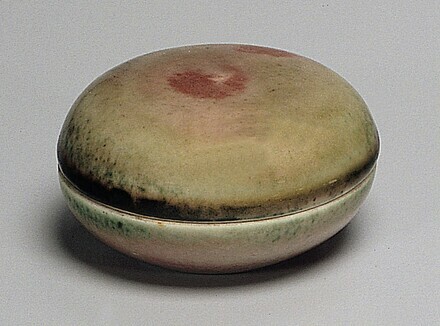 Abrasions and scratches are evident on the glaze of the cover. Inside the top are two small firing cracks. 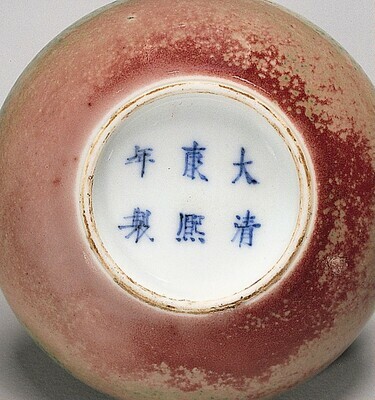 The underglaze cobalt blue of the mark is dark, and the characters are widely spaced. Morgan 1904-1911, 2:80, no. 1324, pl. 123 (bottom left). Bower, Virginia, Josephine Hadley Knapp, Stephen Little, and Robert Wilson Torchia. Decorative Arts, Part II: Far Eastern Ceramics and Paintings; Persian and Indian Rugs and Carpets. The Collections of the National Gallery of Art Systematic Catalogue. Washington, D.C., 1998: 58-60, color repro.